We'd like to dedicate today's blog post to the amazing community of Blender developers and users. We began our animation journey with 3ds Max, wanting to use the Character Animation Toolkit plugin. Soon enough it became clear that due to bugs and missing tools, we'd need to look elsewhere. The constant cries, threats and desk-banging by Cenda (our animator, video wizard and former Softimage user) have finally paid of. Other team members found out that Blender is incredibly powerful and easy to use 3D software. Blender is also free and open source. What a combo! Blender fit right into our workflow and export to Unity is a breeze. Cenda is making good use of Python scripting language for add-ons that further speed up the animation process. 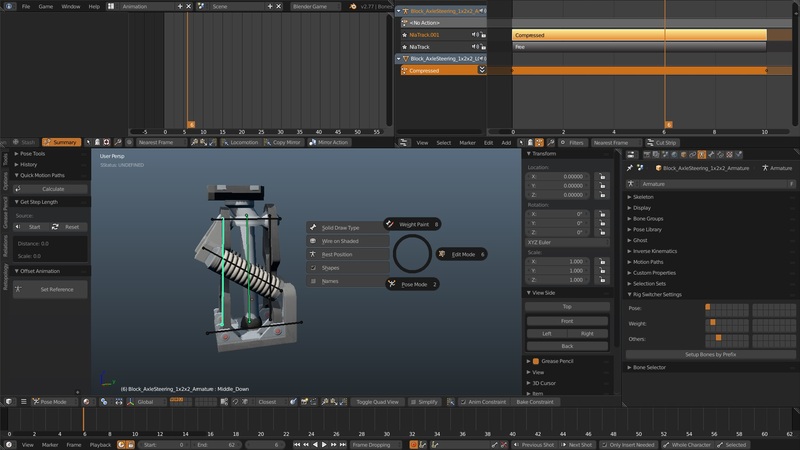 With this great animation user experience we could very well use Blender for modeling as well. We are looking forward to PBR Viewports, currently in development. And hoping to see close collaboration between Blender and Unity. Time to demonstrate what we mean. With our animation progress reaching a satisfactory level we are happy to present the salamander taking a bite. Here's the main character walking. This is the animation process. And here you can see it finalized for Planet Nomads. We are creating our own add-ons and will be sharing them on Blender forums once they are polished. Thanks again to Blender and its relentless army of developers, who made this possible. Check the list of features, past, present and future, on Planet Nomads Trello board.